The day after the Southern Weekend incident broke on January 3rd of this year, which stirred waves in China and beyond, a national conference of propaganda chiefs was held. Liu Yunshan (刘云山), the member of the Politburo Standing Committee in charge of propaganda and secretary of the Secretariat of the CCP Central Committee, attended the meeting and gave a speech. The Chinese media didn’t elaborate on it probably because Xi Jinping and none of the other standing committee members attended it. The Xinhua news agency had a short release, mentioning Liu Yuanshan’s speech and not much else. This propaganda tsar from Inner Mongolia was the head of the CCP’s propaganda department for the entire tenure of Hu Jintao and Wen Jiabao’s ten-year reign. He is known for his talks of party platitude, and has not produced anything that could be called a signature speech. Inside the system, the first denunciation of universal values came from Chen Kuiyuan (陈奎元), the president and party chief of the Chinese Academy of Social Sciences, in a speech he delivered during the academy’s reform seminar held on July 26, 2008. Five months later, the first issue in 2009 of the party’s Qiushi magazine (《求是》, or Seeking Truth) published Liu Yunshan’s speech “Looking Back and Looking Forward,” delivered on December 25, 2008 during a forum of the heads of the CCP’s national-level propaganda and cultural units. It was a “study and discuss” session for Hu Jintao’s speech during a conference commemorating the 30th anniversary of the third session of the 11th Central Committee of the CCP. In this speech, Liu Yunshan required the propaganda chiefs to “steadily push forward the construction of the socialist core value system, to better pull together spirit and qi, and to strengthen the foundations and roots.” “The socialist core value system,” he said, “is the essential embodiment of the socialist ideology and is the pillar of the contemporary Chinese people.” Liu’s highlighting the so-called “socialist core value system” was seen by many as a refrain of Chen Kuiyuan’s speech against universal values. Now, six months into Xi Jinping’s “new reign,” what Liu Yunshan said before, by comparison, was nothing nearly as alarming as what he has been up to currently. What does “erecting political awareness” entail? Is it the same as “keeping in lock step with the Central Leadership” that we used to hear a lot during the Jiang Zemin era and the Hu Jintao era? 5. Strengthen the party’s leadership over the media. This has to start from the education of media practitioners, and those with “new three anti” tendencies are not allowed to teach journalism in universities. Once leaked, these five points shocked many and invited heated argument online. Overjoyed Maoist websites re-posted the article, while liberals roundly condemned them. On April 10th, the CCP’s two Hong Kong-based newspapers, Ta Kun Pao and Wen Wei Po, came out together to deny “rumors”: there had never been a “CCP propaganda work meeting,” and the so-called “new three antis” was a baseless rumor. The next day though, on April 11th, the Red Flag Journal (《红旗文稿》), a subordinate publication of Seeking Truth magazine, published an article entitled Comprehensively Manage the Two Media Fields to Unite Positive Social Energy (read a complete translation here) by Ren Xianliang (任贤良), a deputy director of the Shaanxi Provincial CCP Propaganda Department and also a vice-chairman of the All-China Journalists Association (中国记协).The article belligerently called for tightened management of new media and occupying new fronts of public opinions, and was widely re-posted by Xinhua, People’s Daily and major gateway sites. Ren Xianliang defined the internet-based new media and traditional state-owned media in terms of enemy vs. us. He believes that the emergence of blogs, microblogs and other forms of self-media has in effect demolished the Chinese government’s prohibition of private media and its ban on media exposé of events out of regional boundaries, and opened up a “micro-era” where everyone is a journalist. Personal media are “unfettered” and “uninhibited,” he argued, and they can exert influence as powerfully as a newspaper or a news agency. They not only challenge the fundamental principle that the party alone runs the media, he opined, they also lead to class divide and confrontation and damage the credibility of the government. Some forces “manipulate” online opinions, fabricate political “rumors,” viciously denigrate the image of the party and the state, and dismantle the foundation on which the party governs. He describes the Southern Weekend incident as “flagrantly challenging the party’s news media management system.” He called for internet censors to rein in more stringently those well-known online leakers, “Big V” Weibo accounts (verified accounts with a large number of followers), “warning them when warning is due, shutting them up when they should be shut up, and closing them down when it is called for.” Meanwhile, he proposed to “transform, sponsor and cultivate” a large number of opinion leaders who understand, recognize and support the guidelines and policies of the party and the state, and to influence and lead public opinions through them. Ren Xianliang’s article in a way confirmed the existence of the “new three antis,” and it brought about another torrent of online backlash. Beginning from April 12, in an effort to silence the discussion, accounts were frozen or deleted, not just those of the critics, but also those of Ren Xianliang and Zhang Hongliang (张宏良, a Maoist intellectual). Phrases like “new three antis” and “traitor to the Han people” were censored. A big name from the People’s Daily revealed that the leadership of the paper had been informed of the key points of the national conference of propaganda chiefs which indeed included the phrase “new three antis,” an invention of China’s propaganda tsar. On April 19, the world media was flabbergasted to learn that the Ta Kun Pao, the CCP’s paper in Hong Kong known for “quashing rumors” about mainland politics, had fabricated the false story of Xi Jinping riding Beijing taxi. In late April, the General Office of the Communist Party issued Document No. 9 to the county/military division level across the country. The document is called the Minutes of the 2013 National Conference of Propaganda Chiefs — Briefing on the Current Situation in the Field of Ideology with Liu Yunshan’s speech, in its entirety, attached to it. Documents of the CCP General Office are only second to those of the Central Committee, and they must be signed by the entire Standing Committee. So this is not just about Liu Yunshan anymore. Document No. 9 is divided into three parts: 1) Situation, 2) Problems, and 3) Countermeasures. The Concepts of Democracy and Constitutional Government: The goal of this is to overthrow the leadership of the Communist Party and subvert the political power of the state. The Southern Weekend incident was a brazen provocation. Universal Values: The core of this is to dispel the leadership of the party and force the party to make concessions. Civil Society: The main purpose of this is to establish new political forces outside of the party’s grass roots units. Neoliberalism: This is against the state exerting macroeconomic controls. Western Ideas of the Press: These ideas are against the “mouthpiece theory” that the party has consistently held fast to. They want (the press) to break free from the party’s leadership over the media and open things up, creating havoc for the party and society by stirring up public opinions. Historical Nihilism: This takes issue with the historical problems under the party leadership and disputes facts that have already been widely accepted. The most noted example is that it makes a great effort to disparage and attack Mao Zedong and Mao Zedong thought, negating the historical role that the CCP played during the period of Mao Zedong’s leadership. The goal is to whittle down, even overthrow, the legitimacy of the party’s leadership. Distortion of Opening and Reform: This criticizes the emergence of a bureaucratic bourgeoisie and state capitalism. It believes that that China’s reform is not thorough, and that only by carrying out political reform can economic reform be implemented. 1. Consolidate and strengthen positive, healthy, and progressive mainstream thinking and public opinions, spread the voice of the party and government, display the mainstream of the current society and reflect the aspirations of the people and the masses. 2. Educate everyone. Launch publicity education on socialism with Chinese characteristics, guide the whole party and whole society to further strengthen confidence in our path, confidence in our theory, and confidence in our system, and strive to realize the “Chinese dream” on this path of socialism with Chinese characteristics. 3. Strengthen the party’s leadership over the media, improve the compartmentalized accountability system, and be able to track down the individuals who are responsible for problems when they arise. The most serious issue with Document No. 9 is its outdated concepts. It is not a small, but a long regression from the Hu and Wen era. Hu and Wen at least kept in line with the third plenary session of the 11th CCP Central Committee that marked China’s opening-up more than thirty years ago. A leader without modern ideas cannot possibly have the vision required to lead. How is he going to cope in an age of development with high cost? Alas, what a pity for China! ¹The “three antis campaign”: The anti-corruption, anti-waste and anti-bureaucracy campaign in early 1950s was one of a long string of political campaigns in China that targeted communist cadres who had become too close to capitalists from the previous era. Gao Yu (高瑜) is an independent journalist and columnist based in Beijing. 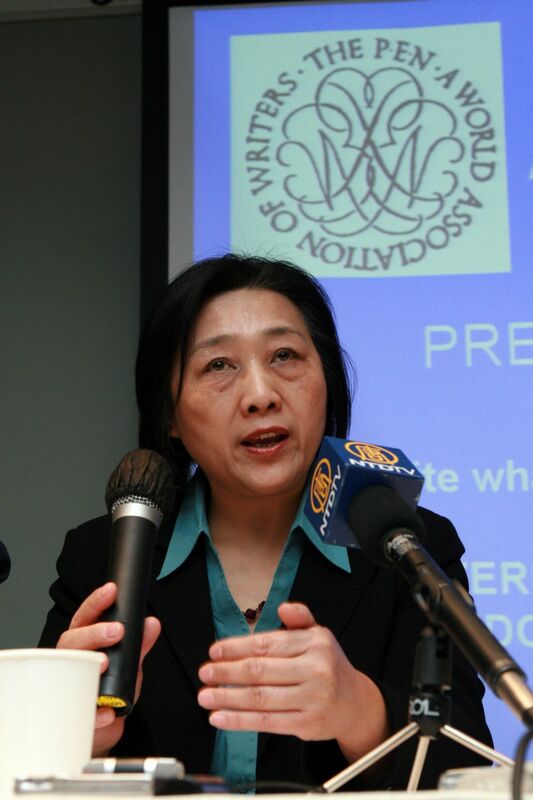 She used to work for China News Agency (中新社), and later was the deputy editor-in-chief of Economics Weekly (《经济学周报》, 1982-1989). She was twice imprisoned for her participation in the 1989 democratic movement. Drawing on her access to exclusive sources, she writes among other things about Beijing’s inner political circles, and her work is influential. This is a translation of a revised copy made available to ChinaChange.org. The original can be read here. By China Change in Analyses and Opinions, Political Transition on May 16, 2013 . Our own Capitalist Party adheres to the five no’s, too. It brooks no other ideology, no diversification of guiding principles (privatize gains, socialize losses, for example), no (serious) separation of powers, no real federal system, and no socialization. These policies in themselves are not significant; China thrives under them while we wither. What IS a significant differentiator is the honesty and competence of the two governments. China has a clear advantage in both measures, as their public opinion polls demonstrate. I don’t want to be mean. But, with all the kindness and nicety of the world, let me just say: You don’t know what you’re talking about. CCP doesn’t want to change, wouldn’t dare to change, for fear of its collapse. But without making fundamental political changes, without establishing formal institutions, they don’t have the tools to solve China’s problems and their own problems. The only tool in their tool box is violence. Every time they become nervous, they step up the violence. This is how they have been for decades, and this is how they still are. What is “Marxism, Leninism, and Mao Zedong thought” anyway? It is the CCP’s standard phrase for stepping up suppression whether it was 1957, 1966, 1972, 1987 … or 2013. “At the center of the center of China lies a corpse that nobody dares remove,” Italian journalist Tiziano Terzani wrote in 1985.